Route 50 in Middleburg's commercial area. This section outlines in detail the preliminary plan developed by the citizens at the workshops. This represents what the people want, not only for their community, but for the road, street, and sidewalk in front of their homes or businesses, and for the towns they frequent. Each workshop addressed specific sections of the road or the towns, and each community did the design for its own area. Comments from the Open House were combined with the plans and comments from the workshops to form the Community Traffic Calming Plan. More than 300 people directly contributed to the plan. 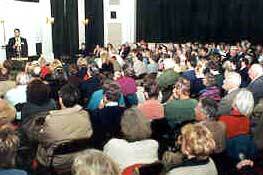 Because of the way the plan was prepared -- in public and by the public -- it enjoys a high level of community support. Most important, it is referred to as a Preliminary Plan because citizens will have future opportunities to make adjustments as it is prepared in greater detail and, ultimately, engineered for construction. This report includes maps of each town with selected Traffic Calming measures illustrated from a street-level point of view. The Supplement to this report provides reproductions of the actual maps on which citizens drew their Traffic Calming ideas and wrote their comments. For the purpose of definition, Route 50 is referred to as the "road" where it travels between or beyond the villages, and is called the "main street" inside the village limits. Travelers will be informed that they are arriving and leaving distinctive areas through the use of entrance features. This is the first measure in adjusting the perception and driving behavior of motorists. The areas include The Mosby Heritage Area, Aldie, Middleburg, and Upperville. The feeling of the road between the towns will be different from the rest of Route 50, and the feeling of the main streets will be different from that of the road, so that motorists are further encouraged to "drive differently" as they approach the various areas. The entrance features will, therefore, indicate a meaningful transition. The maximum posted speed limits between the villages will be 50 mph and within the villages, 25 mph. Transition areas will be posted at 35 mph. Traffic Calming measures will be used in the villages, not to impede traffic, but to help self-enforce the desired speeds and to accommodate pedestrians, cyclists, and other non-motorized users. These measures must be placed no more than 300 to 400 feet apart to function properly, that is, to keep drivers from speeding up between them. The plan is described using reduced drawings and written descriptions and explanations. The intent of this chapter is to guide readers through the Plan so that: the intent of, and the relationship between, the Traffic Calming measures will be understood, it is demonstrated that a great deal of thought and effort was used to develop the plans, and adequate information is provided to allow decision makers to approve the project at this stage. The first area distinguished by the Plan is the Mosby Heritage Area. So that drivers recognize that they are approaching or leaving the Mosby Heritage Area, two components work together: entrance features and a change in the design and feeling of the road. Just east of the Mount Zion Church: At the workshop for the area from Mt. Zion Church to Gilberts Corner, residents and business owners agreed that the entrance feature should be east of the church and that this section of Route 50 should be included in the Mosby Heritage Area and this project. Immediately east of the intersection of Route 50 and Route 17: Participants at the workshop for this area determined that the western entrance feature for the Mosby Heritage Area should be placed at the intersection in such a way that it is clearly visible to eastbound travelers. Drivers would then have an opportunity to choose an alternate route if so desired. They will be bold and highly visible, compatible with the environment and architecture of the area, and either arching over the road or built very close to the side of the road. Studies have shown that overhead features are more noticeable to drivers than those placed on the side of the road. Where very long sight-distances exist, which encourage faster driving, overhead features shorten that distance and focus the driver's attention on the immediate area. They will be designed to physically prevent the expansion of Route 50 beyond a two-lane cross-section. They will be designed according to community preferences. Though the Mosby Heritage Area would normally require only two entrance features, there is need for an additional two. Route 15 crosses Route 50 in the Heritage Area at Gilberts Corner. To inform drivers turning off of Route 15 on to Route 50 that they are entering the Mosby Heritage Area, entrance features are placed on Route 50 on both sides of the intersection. These entrance features will share the characteristics of the outer entrances, but they may be smaller depending on the preferences of the community. A paved surface that will remain at its current width, edged with grass shoulders constructed according to the National Park Service's guidelines for building stabilized grass shoulders. A maximum posted speed limit of 50 mph or lower. Shrubbery and trees planted and allowed to grow as close to the edge of the road as possible. This changes the driver's visual field from a wide horizontal one, which promotes a false sense of security and encourages faster speeds, to a taller, narrower one, which tends to discourage speeding. Guardrails, where needed, made of natural material, such as steel-reinforced wood or concrete clad with stone similar to those used on the George Washington Parkway (following the U.S. Department of Transportation, Federal Highway Administration's "Summary Report on Aesthetic Bridge Rails and Guardrails, No. FHWA-SA-91-051). All roadside stone walls preserved or restored if in disrepair. Speed limits on the approaches to the villages reduced to 35 mph to alert drivers that they are about to enter a residential and commercial town and allow them time to slow down before they get there. Planted median strips or an area of white cobblestone to replace the areas marked with painted lines at intersections where there are turn lanes. This will beautify those sites and eliminate the need for repeated painting. With these changes, the road within the Mosby Heritage Area will create a different driving experience than that of the traditionally designed sections of Route 50. The road design as defined by the Plan also complements the scenic and historic value of the area. Currently, drivers on Rural Route 50 do not know that they have arrived in any of the villages until they are well into town, often traveling at high speeds. Therefore, Aldie, Middleburg, and Upperville are each defined in the Preliminary Plan by entrance features to inform travelers that they are entering or leaving each of the villages. Where the speed limit has been reduced to 35 mph, a series of strips of cobblestone or paving stone are built across the road at increasingly closer spacing to get drivers' attention. Trees or other plantings placed near both ends of the strips make the strips more conspicuous and discourage drivers from going around them on the grass shoulders. The trees/plantings also create the vertical visual field that further encourages drivers to slow down. At the entrance features, the speed limit changes to 25 mph. The town entrance features will share the same characteristics as those for the Mosby Heritage Area, but will be designed and approved by each community. 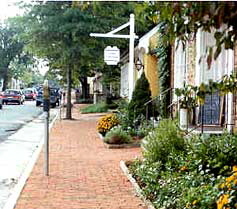 In the Preliminary Plan, the "main street" in each village is defined as Route 50 between the entrance features. The street design changes so that drivers will readily perceive it as different from the rest of the "road." Drivers are more likely to respect the intent of the Plan if the street looks like a part of the community rather than a highway. Where there are no curbs, the white lines on the sides of the main streets are replaced with rows of white paving stones embedded at street level to form a border between the asphalt and the grass shoulders. The paving strips perform the same function as painted lines but look more historic and do not require re-painting. Where there are curbs, they are the mountable type so that vehicles can pull over in case of a breakdown or to allow the passage of emergency vehicles. Trees are planted near the sides of the streets and within the landscaped portions of the streets to provide a sense of enclosure. Trees are spaced to allow vehicles to pull over as needed. In addition to entrance features, other Traffic Calming measures are used in all three of the villages to self-enforce the low speed limits and to accommodate the non-motor-vehicle users of the streets.